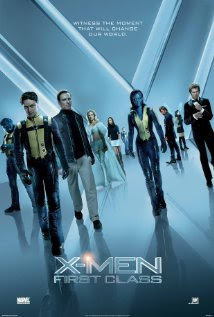 After the disappointment of the last two X-Men movies, I didn't have high hopes for the reboot (or should I say prequel?) of the franchise. I was glad to see that Bryan Singer and Stan Lee were involved as producers. (Does anyone know if Stan Lee made a cameo? Because if he did, I missed it. On the other hand, look out for two cameos; one I especially enjoyed.) Matthew Vaughn's spirited film is intelligent, funny, and much exposition occurs in a very short time. Although its themes are serious and dark, the filmmakers manage to keep it light and fast-paced somehow. The strong performances are what elevates and sets the film apart from recent (and possibly future) forgettable comic book film adaptations. We know from the previous movies that Magneto (Erik Lehnsherr before he turned into the Big Bad) initially displayed his powers at a Nazi concentration camp. This time, we get the full back story, with Kevin Bacon clearly enjoying his role as an evil German doctor wanting to exploit the young mutant's talents. At the same time, Charles Xavier meets a scaly orange-haired blue girl named Raven (played by Jennifer Lawrence as an adult) in Westchester, New York. Like most arch-enemies---at least in the Smallville series and the Wicked musical---the boys grow up, meet in a spectacular fashion, and become good friends. The future Professor X is somewhat of a ladies' man (telepathy is a handy tool when picking up women), while the damaged Erik is obviously a tortured soul. This is the story of how their individual and unique experiences as mutants and outcasts set them on divergent paths. A re-imagining of the Cuban missile crisis is a major plot point, and the clever alternate history makes for interesting viewing. And of course, its message of intolerance, discrimination, bigotry will resonate with audiences. Don't bother to stay after the closing credits. No bonus scene. Otherwise, X-Men: First Class is first rate fun!